Mike Sainristil of Everett celebrates with the MIAA Div. 1 Super Bowl trophy after defeating Xaverian 35-10 at Gillette Stadium, Saturday, Dec. 2, 2017. Everett players celebrate their 35-10 MIAA Div. 1 Super Bowl win over Xaverian at Gillette Stadium, Saturday, Dec. 2, 2017. David Zorrilla holds the ball for Caio Costa of Everett on an extra point attempt during their 35-10 MIAA Div. 1 Super Bowl win over Xaverian at Gillette Stadium, Saturday, Dec. 2, 2017. Anthony Norcia of Everett carries the ball as he is wrapped up by an Xaverian player during their 35-10 MIAA Div. 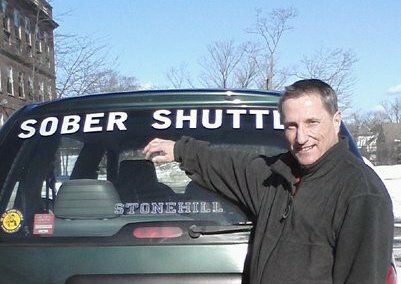 1 Super Bowl win at Gillette Stadium, Saturday, Dec. 2, 2017. Players on the Everett sidelines cheer after stopping Xaverian at the goal line late in the third quarter during their 35-10 MIAA Div. 1 Super Bowl win at Gillette Stadium, Saturday, Dec. 2, 2017. Everett quarterback Jake Willcox hands the ball off to Kevin Brown during their 35-10 MIAA Div. 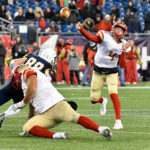 1 Super Bowl win over Xaverian at Gillette Stadium, Saturday, Dec. 2, 2017. Edwin Coriano and Wilson Frederic of Everett tackle Michael Saliba of Xaverian during their 35-10 MIAA Div. 1 Super Bowl win at Gillette Stadium, Saturday, Dec. 2, 2017. 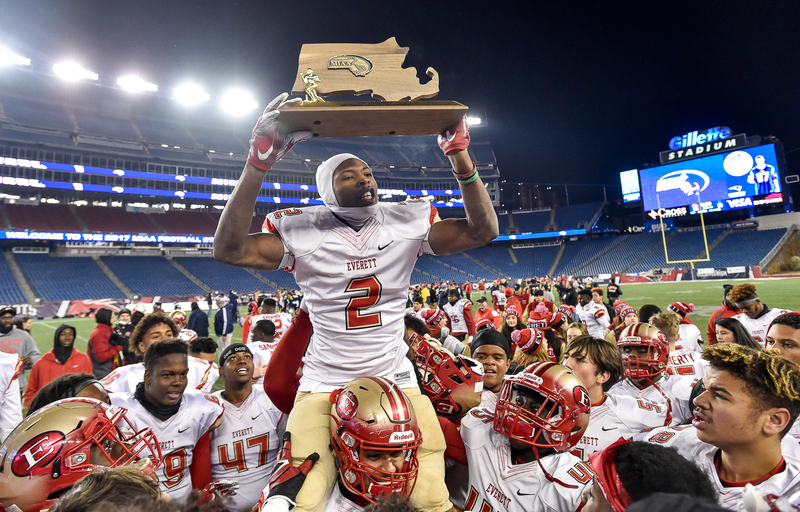 Jason Maitre of Everett celebrates with the MIAA Div. 1 Super Bowl trophy after defeating Xaverian 35-10 at Gillette Stadium, Saturday, Dec. 2, 2017. Anthony Norcia of Everett carries the ball during their 35-10 MIAA Div. 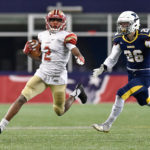 1 Super Bowl win over Xaverian at Gillette Stadium, Saturday, Dec. 2, 2017. 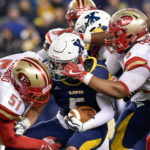 Mike Sainristil of Everett carries the ball as he is trailed by Justin Wenstrom of Xaverian during their 35-10 MIAA Div. 1 Super Bowl win at Gillette Stadium, Saturday, Dec. 2, 2017. 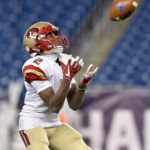 Isaiah Likely of Everett breaks up this pass intended for Brian Abraham of Xaverian during their 35-10 MIAA Div. 1 Super Bowl win at Gillette Stadium, Saturday, Dec. 2, 2017. Jason Maitre of Everett catches this punt during their 35-10 MIAA Div. 1 Super Bowl win over Xaverian at Gillette Stadium, Saturday, Dec. 2, 2017. 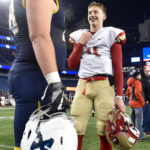 Jake Wilcox of Everett talks with Domenic DePaoli of Xaverian after their 35-10 MIAA Div. 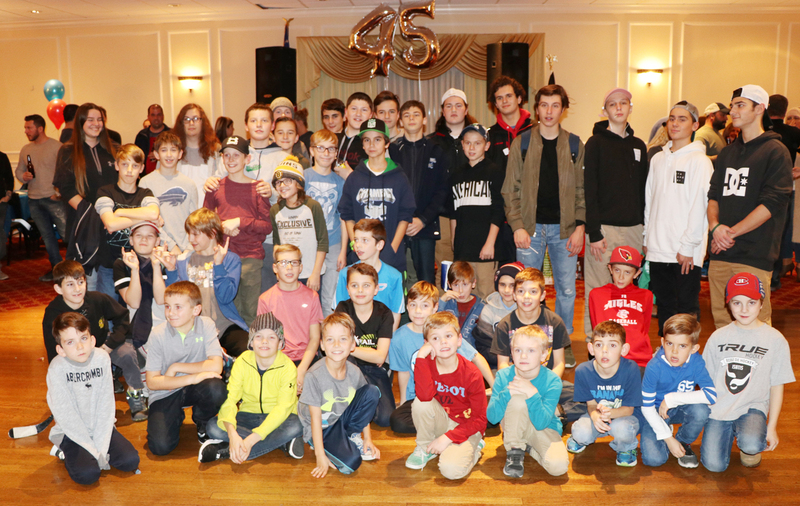 1 Super Bowl win at Gillette Stadium, Saturday, Dec. 2, 2017. 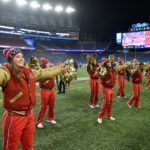 Members of the Everett High School cheerleading team pump up the crowd along the sidelines during Everett’s 35-10 MIAA Div. 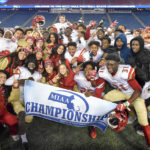 1 Super Bowl win over Xaverian at Gillette Stadium, Saturday, Dec. 2, 2017. Everett quarterback Jake Willcox passes the ball during their 35-10 MIAA Div. 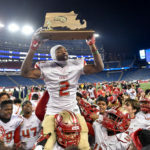 1 Super Bowl win over Xaverian at Gillette Stadium, Saturday, Dec. 2, 2017. 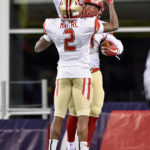 Jason Maitre and Mike Sainristil of Everett celebrate a touchdown during their 35-10 MIAA Div. 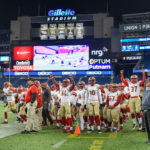 1 Super Bowl win over Xaverian at Gillette Stadium, Saturday, Dec. 2, 2017. 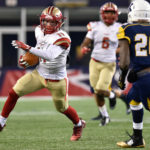 Jason Maitre of Everett runs the ball as he is trailed by Cooper DeVeau of Xaverian during their 35-10 MIAA Div. 1 Super Bowl win at Gillette Stadium, Saturday, Dec. 2, 2017. 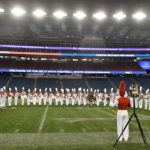 Members of the Everett High School marching band perform their half-time show during Everett’s 35-10 MIAA Div. 1 Super Bowl win over Xaverian at Gillette Stadium, Saturday, Dec. 2, 2017. 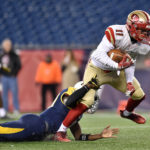 Kevin Brown of Everett runs the ball as he is trailed by Trevor Carroll of Xaverian their 35-10 MIAA Div. 1 Super Bowl win at Gillette Stadium, Saturday, Dec. 2, 2017. Jason Maitre and Anthony Norcia of Everett celebrate a touchdown during their 35-10 MIAA Div. 1 Super Bowl win over Xaverian at Gillette Stadium, Saturday, Dec. 2, 2017. 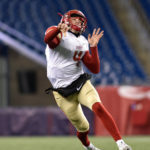 Everett quarterback Jake Wilcox passes the ball during their 35-10 MIAA Div. 1 Super Bowl win over Xaverian at Gillette Stadium, Saturday, Dec. 2, 2017. Everett players pose with the MIAA Championship banner after their 35-10 MIAA Div. 1 Super Bowl win over Xaverian at Gillette Stadium, Saturday, Dec. 2, 2017. Everett players Shaddai Irung and Jake Wilcox embrace after their 35-10 MIAA Div. 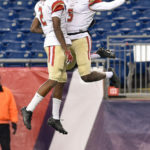 1 Super Bowl win over Xaverian at Gillette Stadium, Saturday, Dec. 2, 2017.